This is officially my first post about our wedding, and it’s a doozy. Let me start by saying that if you thought planning a destination wedding would be easier and cheaper – you are wrong. Trying to plan a wedding (a small one, no less), from 10 hours away from the actual destination is turning into a headache, and it started with finding a venue. We already have a venue in place (mind you, I haven’t seen it yet, so maybe I am a little nuts), and it seems to be perfect. It’s in the Keys, it’s a private residence and it’s free (for us, anyways). Before we officially got word that the venue was ours for the wedding, we went searching online for other potential venues in case this one was a no-go. We specifically were looking for a private residence because we want the feeling of an intimate setting with a few close friends and family. We found one house that was beautiful – it had its own beach, the price was decent, it was large enough, and several reviews of the place revealed it was perfect for weddings – what else do you need? So I emailed the guy – and his response was “sorry, no weddings.” Straight and to the point. I was like ok, don’t want to waste this guy’s time – so I moved on. Innocent enough, right? I’m sure there a slight twinge of annoyance, but professional nevertheless. Well, things escalated quickly after this simple inquiry. 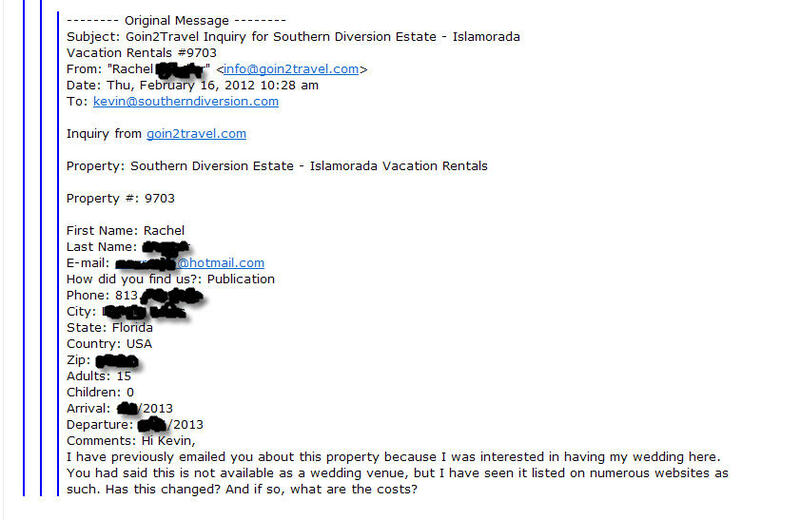 Kevin Melilli of Southern Diversion, you just messed up big time. I happen to understand marketing, advertising, reviews, keywords, tags AND search engine optimization. What’s lesson here, folks? Don’t mess with a bride planning her wedding – oh yeah, and one who happens to have a PUBLIC BLOG. It amazes me that there are people this stupid out there.. and that’s only referring to his spelling. SERIOUSLY.. who writes like that? You may be on your phone sir, but you are sending an email representing a business. “I wood nvr rent UR prop” DUDE. He’s an idiot if he thinks you wouldn’t take his terrible customer service and put it on blast. Way to go, dumb dumb. You’ve just opened a whole can of worms due to lack of professionalism and being able to explain your policy — no matter how flimsy it is. *Not being able to explain … so fired up, I can’t even see straight! I am sort of hoping you will book this place as a ‘vacation’ then hold your wedding there without telling ol’ Kev until afterwards. Let that A-hole reed abt it l8r. Are you becoming one of those Bridezillas.. Oh Oh.. Everyone Watch Out!! !